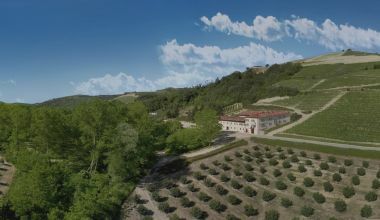 The story begins in Neviglie, on the verdant hills of Barbaresco, among lush vineyards, hazel groves and woods: the Agriturismo Marcarini is born in fact in an ancient structure of the XIX Century, at the time called "Sargentin". Not just a simple farm, but a quiet and bucolic peace nest, a location full of charm ready to accommodate anyone looking for a moment of relaxation. 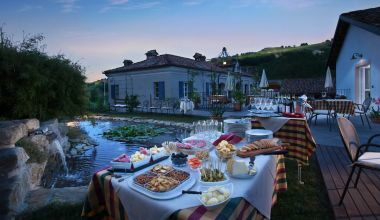 The love of the Marcarini family has made this romantic farmhouse a place of harmony and serenity, a starting point for discovering a magical territory, rich in flavors and tradition. We like the idea of being able to offer our guests a refuge to regenerate themselves and to move away, even just for a moment, from the frenetic pace of everyday life. Immersed in quietness, in a cordial atmosphere and unexpected poetry, you can experience a unique and unforgettable stay in a romantic farmhouse. Book directly on our website to enjoy exclusive benefits and experiences. The building that houses the structure was the residence of Vittorio Doglio, sergeant of the Savoy in the second half of the nineteenth century. His low and robust constitution earned him the nickname of "Sargentin" (the "little sergeant") who, by tradition, went on to indicate the farmhouse now home to the Agriturismo Marcarini. 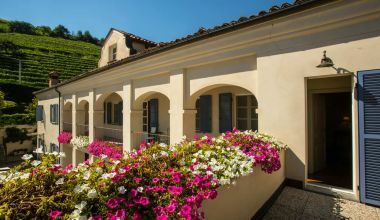 Doglio managed to give prestige and importance to this farmhouse by renting, since the nineteenth century, its elegant rooms to all those who underwent the restorative "care" of Dolcetto and sulphurous water, which flowed naturally here. In 1995, bewitched by the beauty of the environment and the ancient charm of the farmhouse, we bought the property, beginning the renovation works and bringing the farmhouse back to the splendor of the past.